I take reader requests from time to time, and the Zebra R-301 Stainless Steel Refillable Roller Ball was one such request. I first learned of this pen last year from Brian at Office Supply Geek and knowing the style of writing instrument I prefer I wasn’t too eager to give it a shot. Wide tipped liquid ink pens just aren’t my thing, but it obviously doesn’t take much to twist my arm. The first thing I noticed about this pen is that the design is based directly off the Zebra H-301 Highlighter. That is a good thing because the barrel design is great. I love the look of the stainless steel contrasted against the black plastic. The only issue I find is that the cap does not post tightly. It is loose and spins a little but it won’t go as far as falling off. From an ink perspective it is HEAVY. The tip size is 0.7 mm but it writes wider because of the flow. In fact, I had to write very fast to stay ahead of the bleed. It is dark and consistent though, so any of you who like to write with liquid ink pens may enjoy it. That it is refillable is an added bonus. I picked up my R-301 at Staples so you should be able to find these pretty easily at your local office supply retailer. If you own one please let me know what you think in the comments section. 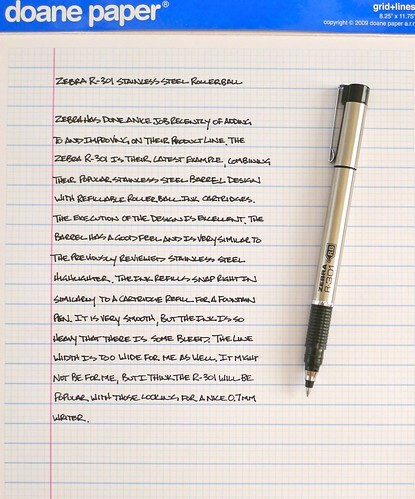 Posted on January 27, 2012 by Brad Dowdy and filed under Pen Reviews, R-301, Zebra.